Three strong contenders here, with the Mil Milhas also getting an honourable mention in fourth (this section nominally at least being titled ‘Europe and the Rest of the World’). Third spot went to the 1000kms at the Nurburgring, part and parcel of a great season of LMES racing. It was a win from the back of the grid for the Shimoda / Chilton combo aboard the Zytek Engineering 04S, pipping the Oreca Audi and the Creation DBA Judd to the post. There was a first win for the Aston Martin DBR9 in the LMES (in fact the first time the Ferrari 550 had ever been beaten in the LMES). It was a third consecutive win in GT2 for the epic combination of Marc Lieb and Xavier Pompidou, enough to secure a second consecutive LMES GT2 title for Sebah Motorsport – a great race. 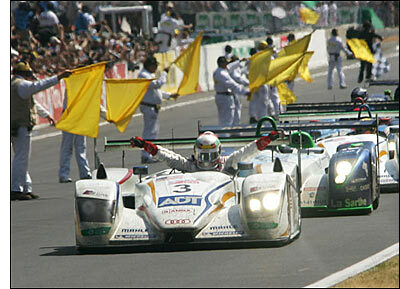 But it was bettered here by the granddaddy of them all – for a seventh win from Tom Kristensen, a fifth win for the Audi R8 (and a well deserved win from Champion Racing after a gripping battle of pace vs. reliability against the much faster Pescarolos), an astonishing battle against adversity from RML to win LMP2, a head to head battle to the flag (or almost!) in GT1. which finally went the way of the Corvettes, and a fairytale win in GT2 from AJR / BAM! Second place goes to one of the most gripping Le Mans 24 Hours in years. The winner here though was dramatic from beginning to the very end. Astonishingly it is yet another race held at Silverstone (far from a favourite venue amongst dsc’s writers and photographers) and again it featured biblically awful weather. The opening three hours of the race were punctuated regularly with appearances from the safety car and there were early disappointments for the factory Zytek and the Hybrid Pescarolo. There was fabulous stuff though in the very worst of the weather from Xavier Pompidou in the Sebah Porsche (up to sixth overall during the deluge), from Wolfgang Kaufmann, who comfortably led GT1 in the early hours in the A-Level Turbo Porsche, from Allan McNish in the Oreca Audi, Nic Minassian in the Creation DBA and Thomas Erdos, stunning in the early stages in the RML MG Lola. It would be a dramatic race throughout, but never more so than in the closing minutes, with the Creation boys sniffing the possibility of a win and Oreca needing to make a late race stop to hand the R8 over to Stephane Ortelli, the Frenchman having to get up to speed driving in the dark for the first time, with Jamie Campbell-Walter closing very fast indeed. JC-W got right onto the tail of the Audi but Ortelli showed his class and it was a real heartbreaker for Mike Jankowski’s squad – but what a race! 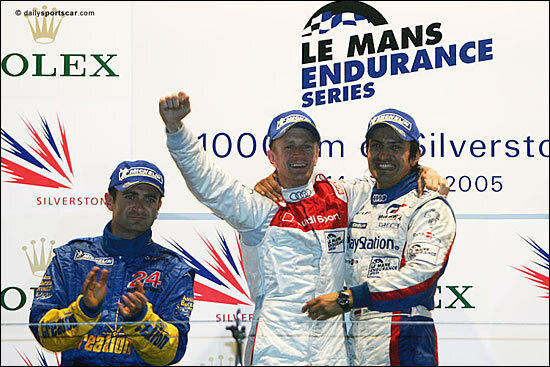 dailysportscar.com’s 2005 European Race of the Year is the Silverstone 1000kms. “It doesn’t get any better than this” Johannes Gauglica.